The name Cotentin Schooner was chosen because it describes the type of vessel often seen off the west coast of the Cotentin peninsula and the Channel Islands at the beginning of the 20th century, and which disappeared from view during the 1930s. As with all types of working sailing ship, adapted to a particular time and requirement, she is the result of a natural evolution which ran in parallel with changes in both navigational methods and ports. The rigging, originally similar to that of the coasting lugger, was underwent modifications from 1850 onwards, reaching its definitive shape in 1880. There are two types of schooner, identifiable by their ‘trade’ and their geographical distribution: small schooners (4.5 to 8 m) were used for pots and long-line fishing, whilst the larger schooners (11 to 14 m) were used for net and trawler fishing, often going as far as the English coast. They were also used for coastal trade, as pilot vessels and for carrying passengers. The Neire Maôve ("black seagull" in Norman patois) is a large schooner, inspired by the Lilian (which was designed by Henry Bisson in Guernsey). 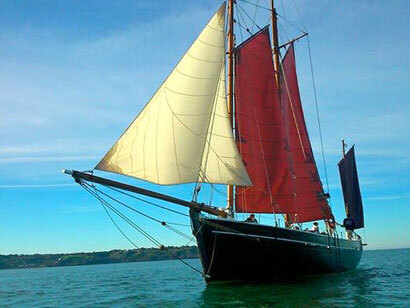 The schooner, built through the initiative of the AVGCI (Côte des Isles Association for Traditional Rigged Sailing Vessels), was redesigned by Alan Buchanan, a naval architect from Jersey. Work started on construction in 1991, on the port of Barneville-Carteret, and the construction site was open to the public. The schooner was launched on 4th July 1992. The Neire Maôve has a fore and aft rig with two four cornered sails (foresail and mainsail, topped with a gaff topsail) and a jib tacked to a long bowsprit. During regattas, this rigging is completed by a fore topsail, and a sprit mounted jigger. It is a ship suited to the high seas, but also for grounding in ports and harbours such as those along the Normandy coastline. She sails out of the port of Carteret, along the Cotentin coast, to the Channel Islands, Brittany or England.